A year ago I shared a visualization of our AHT Group Business Model. Following that, I am now sharing our group 2012 Priorities. This comes from the principle of Open Business you can see in the 7 Enablers for our strategy. Our intention is to share more about the drivers of our business. The 2012 priorities document was created for our own internal use to guide our activities and use of resources through this year. However we are happy to make that open, in case anyone else finds looking at our approach is useful to them. Our AHT Group business model specifically describes the relationship between the (currently) three companies in the group and what I do. It is not immediately apparent to anyone outside the group what each company does and how they relate, so it is useful to make that clearer. The 2012 priorities document covers all of the business activities across the group. Particular activities may be run out of one of the existing companies (or possibly new ones), however that is not a critical issue in building our business strategies. 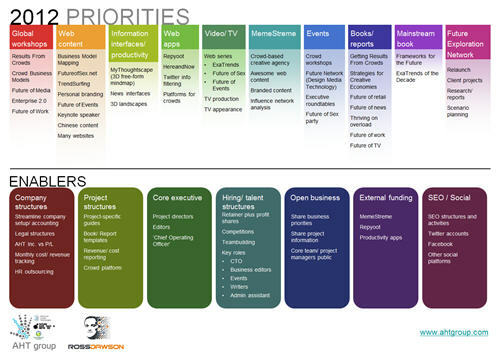 The 2012 priorities is explicitly a group-wide view, across all the companies. As I get the chance I will write more about many of the specific projects and work covered in our 2012 priorities. My posts earlier today looking for partners for global workshops and event managers refer to a couple of our priorities, and in various ways our other activities will be evident sooner, or in some cases a bit later for projects that are still under development. I will also start going into more detail into our business structures, which are described in the Enablers in the 2012 Priorities document. We are implementing our own unique brand of crowd business models, which as for other companies is an experiment in progress. When I have described what I am sharing in our 2012 priorities and intend to share of our business activities, some people ask me why I would do that. It seems to me a far better question is ‘Why not?‘ There is in fact no good reason not to share our business priorities, and a few good reasons to share them, including being able to attract talented people and clients who understand better what we are doing. Other companies that have many direct competitors may have reasons not to share too much of their activities and plans. However I am not trying to do the same as any other company group, and I wish the best of luck to any who wish to try to do the same as us. I believe open business will be central to the future of business. In sharing our 2012 priorities and a lot more information to come about how we do business, I hope over time to demonstrate clearly the value of sharing strategic information about your business activities. https://rossdawson.com/wp-content/uploads/2016/07/rdawson_1500x500_rgb-300x100.png 0 0 Ross Dawson https://rossdawson.com/wp-content/uploads/2016/07/rdawson_1500x500_rgb-300x100.png Ross Dawson2012-01-23 11:02:122012-01-23 11:02:12Open business: Sharing our group priorities for 2012 - Why not?